I don't remember being born, but I know that I was - in Melbourne, on 3rd September 1930. I grew up on my father's wheat and sheep farm in the mallee country of north-western Victoria, at Meatian. "Meatian" (pronounced Meat-ee-an) appears to have been taken from the neighbouring parish and was a local Aboriginal name for "moon", while "mallee" is the name given to types of eucalyptus trees that flourish in arid areas, especially Eucalyptus Dumosa which originally covered a large portion of the area. According to Alfred Kenyon, flowing to the absence of reliable water supplies, there was no tribe of natives belonging to the mallee; one or two coteries only made it their home. The Mallegundeet, the people of the mallee, belonged to the Wimmera, Richardson and Avoca blacks (while) the Millegundeet or Murray blacks, extended over nearly the whole length of the river." The first white man to see the Mallee was Sturt, in his voyage down the Murray in 1830, and the first to cross was Major James Mitchell in 1836. Early explorers on horseback were able to look across the tops of the mallee trees for miles. There were also native pine and porcupine grass, which tore at the trousers of the men and at the legs of the horses. The mallee country covers an area of more than 11 million acres - more than one-fifth of the state of Victoria and part of the north-eastern portion of South Australia. It is triangular in shape, bordered by South Australia to the west and the Murray River to the north. Swan Hill was named by Major Mitchell in his exploration of the area because of the number of white swans he saw on the river at that point. Meatian is situated 25 miles south-west of Swan Hill. Construction work on the section of railway line between Quambatook and Waitchie began on 5th April 1899, to provide goods and services for the early settlers of the area, and was opened on 1st March 1900. Railway stations were built at 10-mile intervals where townships soon sprang up. Meatian is situated between Lalbert, 10 miles to the south and Ultima, 10 miles to the north. Ultima was to become the larger town from which we obtained most of our supplies. The Meatian Railway Station was opened on 1st April 1913. With the coming of the railways, five houses and four single men's huts were built for the railway fettlers and gangers. A Post Office and store were built shortly afterwards. School was first held at the public hall on 12th August 1912 and was furnished with five desks. Seventeen children, aged between six and 14 were ready to start. In October of that year, 10 dual desks were supplied. The school was known as the Meatian Railway Station School, No. 3761. The first teacher was Bessie Campbell. Miss Campbell boarded with the Denton family and rode a white horse to school. Her sister Maude taught at Fairfield. In 1923, the Education Department erected a portable school building, 23 feet x 18 feet at a cost of £167.13s.6d. ($335.35) on a two-acre site 200 yards north-east of the railway station. It was ready for use in April 1923. It was thought that the school "in this well-settled farming district should average 25 - 30 children." In 1924, 32 children were on the roll. This attendance rate remained stable during most of the 1930s, but by the time I left school in 1943, it had dwindled to 12. The school's name was changed in 1930 from Meatian Railway Station School to Meatian when Meatian School No. 3464 had its name changed to Meatian West. Meatian West was five miles west of Meatian. During the 1930s, Meatian consisted of two stores, one of which was the Post Office and Telephone Exchange whose manager, Jack O'Connor, was also the oil company representative, stock and station agent, insurance agent, State Savings Bank of Victoria agent, wool broker, machinery agent, weighbridge and silo operator. It was his generator which ran the lights for the Meatian hall. The other store, which had formerly been owned by Mr H.E. Cuttle, who had also opened the first store in Waitchie, further to the north, was reopened by Clarrie Nixon in 1935. In the same year, the Methodist Church was built and opened by the local Methodist Community. The Methodist Sunday School opened in the hall in 1912 with Robert and Harry Grey as the first Sunday School teachers. As Saturday night was a popular night for dances, church members often found it necessary to clean up the hall on Sunday mornings before a service could be held. This led to a suggestion by George Leach that a committee should be started to raise funds for the building of a church at Meatian. In 1932, a decision was made to build a church and a Ladies' Guild was formed. Mrs Matt Nalder was elected first Guild president with Mrs Nioa as secretary/treasurer. There were 27 members originally. These men set about raising funds. Over the next three years, they would raise £450 - £500, organising annual fetes in the hall grounds, no mean feat in these times of depression. The men assisted by doing the heavy work of setting up trestles and tables, lighting fires, keeping the billy boiling and organising races. In 1934, tenders were called for the building, culminating in the official opening on Sunday, 17th March 1935. Mrs Matt Nalder had the honour of opening the doors. In the early days, wheat was carted to the station by horse and dray, in bags which were stacked beside the railway line. One man loaded the wheat on the elevator while lumpers stacked it up top. The first elevator was made of wood. By 1944, concrete silos were sprouting up at all the stations along the railway line. A concrete silo, with a capacity of 135,000 bushels, was built beside the railway line at Meatian. In the 1945/46 harvest, 126,000 bushels were received at the silo. In 1954 and 1969, additional storage facilities were erected extending the capacity by a further 320,000 bushels. A peak of 660,000 bushels were received in the 1960/61 harvest; in 1969/70, 645,000 bushels were received.11 Farmers trucks had to be altered to carry bulk wheat instead of bags. The railways and the school were to serve the community well for over 60 years. In its heyday, up to nine wheat trains per day used the line as well as a daily passenger train. My father's father, John Johnson, was born in Liverpool, England in 1837, the son of James Johnson, a brushmaker, and Ann Frost. John's elder sister, Elizabeth, came to Australia with her husband, Samuel Edelson, in June 1854. Samuel had come to Victoria in October, l852, at the time of the Victorian gold rushes. Having had some success on the goldfields, he returned to England, sold his business which Elizabeth had been managing in his absence, and returned to Australia with his wife and two small children, William and Ann. Samuel Edelsten was one of the first to open a shop in New Bendigo, (later named St Arnaud), in 1855, and later a hotel and general store at Peter's Diggings, (now known as Carapooee) This became the family home. John, and another sister, Mary Ann, also migrated in the early 1850s. In 1864, John married Jane Liddle, who was a 'currency lass' born in Sydney in 1847. She was the daughter of Adam Liddle and Ann Elizabeth Harding. Adam Liddle was referred to as a moulder on Jane's baptism certificate. John's occupation at the time of his marriage was stated to be storekeeper. John and Jane had 13 children, four of whom were born in the St Arnaud/Peter'sDiggings area: John Edward in 1865 at St Arnaud; Alfred Henry in 1867 at Peter's Diggings; Walter in 1869 and Mary Ann in 1872, both at Stuart Mill. In 1873, John and Jane took out a licence to occupy 240 acres of land at Cope Cope which is about half-way between St Arnaud and Donald, where he built and licensed a hotel on the main road. My father was the first of eight children to be born there, in 1873. Emma Elizabeth was born in 1876 at St Arnaud; William James in 1878 (who died, aged 2) and Rose Ada Jane in 1880, at Cope Cope; Frederick in 1882 at Donald (who died of meningitis at six weeks); Albert Arthur in 1883 and Florence May in 1885, at Cope Cope; and Ellen Victoria in 1887 at Donald. Another son, James, who was born at Cope Cope, died as an infant. In all, 10 children survived childhood. In 1878, John built a store near his hotel but within a month was burnt down. The store and hotel were rebuilt of mud brick. The hotel had 13 rooms, while the store, which measured 35 feet x 30 feet, was used for dances for 200-300 people. I once heard my father describe his father as a man who drove his family hard during this period, especially his mother and sister Emma, for whom my father held strong affections. At the end of 1888, John surrendered the licence for the Bellevue Hotel (better known as Johnson's Hotel), and the property was sold in 1890. With the opening up of land in the mallee, John took up farming land at Birchip and later Nullawil. Land was then being offered at £1 per acre in lots of 500 acres. In 1883, he leased 20 acres at Yalong for Mary Ann, aged 11. In 1887, he leased 473 acres at Tatchera for Charles, aged 14; one square mile at Birchip for Walter, aged 17; and one square mile at Tatchera for Alfred, aged 18. In 1892, two leases were taken out for 570 and 574 acres at Meatian in his wife Jane's name. These two blocks were allotments 41 and 42 which formed part of the distinctive "T" shape of our farm. In 1893, a lease of Lot 43 which formed the right arm of the "T", was transferred to Walter's wife Sarah. This block was known as "Davitt's"; my father's sister Emma married Philip Davitt and they lived in a house on that block. Jane died on 11th April 1900, at Birchip of apoplexy, aged 54 and is buried in the Birchip Cemetery. Jane's two blocks were transferred to John just before her death. John died on 10th December 1907, at our farm which was called "Lowlands", of asthma, influenza and heart failure, aged 74. His health had been chronic for two years before his death. He was buried at Lalbert Cemetery which was the nearest cemetery available at the time. John appears to have gone to live with my father after Jane's death. I do not remember my father ever mentioning that his father died on the farm. Prior to John's death, in 1907, the two blocks of land which had been in Jane's name were transferred to my father's name. In 1910, Lot 43 which had been in Sarah Johnson's name, was also transferred to my father's name, while Lot 34 which formed the left arm of the "T", was purchased from Walter Leach, (brother of George Leach), and transferred to my mother's name in 1926. This block was always referred to as Watty Leach's block. John's hotel crumbled to dust. The other two hotels in Cope Cope were destroyed by fire. Nothing of them now remains, nor is there any remnant of the blacksmith's shop, flour mill, three large stores, fruit and vegetable shops, creamery, police station or doctor's residence which once formed the township of Cope Cope. The school No. 1756 still stands, little altered, and in 1994 was being used as a private home. The block of land on which John's hotel stood is still known as "Johnson's paddock". The road nearby is now named Johnson Road. My father's farm was four miles by road from the Meatian railway station and about seven miles from Ultima. At the age of 14, my father Charlie Johnson, together with his brother Alf who was four years his senior, began the difficult task of clearing the blocks of mallee land that their father John had taken out in their mother's name. My father often spoke of how he and Alf, while clearing the land, had walked round and round in circles throwing mallee stumps, or mallee roots as they are called in some places, on to fires to clear the land. Such fires burnt throughout the mallee for years. What they didn't burn were thrown on to heaps for future generations of home fires, while each year after fallowing further dray loads were added. These stump heaps later became breeding grounds for rabbits. He, and his generation of mallee farmers, cleared heavily, leaving the native mallee along the roads which bounded each property and some clumps in the paddocks as shelter for stock, but the rest they cleared to make way for sheep and wheat. They lived a very hard life camped out in the bush miles from anywhere. Their only form of transport was, as my father described it, "Shank's pony". Water had to be carted by Furphy tank, drawn by horses from Lalbert Lake and in dry years as far as 50 miles from Dumosa. In 1903, the Victorian Water Supply Department erected a pumping station at Long Lake which was known as the Long Lake Water Works. The lake was filled from floodwaters overflowing from Lake Baker and the Little Murray River. Water was pumped through a pipeline westward to Goschen, then through 8000 miles of open channels over an area of 600 square miles between Piangil, Ultima, Lalbert and Long Lake districts. In 1929, the Waranga Basin channel was extended 130 miles to meet the threat of drought, the water travelling by gravitation from Lake Lonsdale in the Grampians and Eildon Weir. To earn money to live on while clearing the land, Pop and Alf also worked on building the railway line which was wendmg its way to the Murray River, eventually to terminate at Robinvale. At first, a small hut with a stone floor was built on the property, beside which his mother Jane planted a pepper tree. The stone floor and the pepper tree remain today as reminders of earlier times. A two-roomed weatherboard dwelling was built, and later two rooms front and back were added. It was to this home that he brought his bride when he married my mother in 1917. Prosperity came on the sheep's backs. Each block of land consisted of approximately 500 acres which were usually fenced into about four paddocks. On the main block of our farm, sheepyards were built near the house paddock which consisted of about 20 acres set in the middle of the 500-acre block. There were three blocks of land which had to be cleared, together with another block purchased from Walter Leach, which eventually completed a farm of about 2000 acres. He would rise before sunrise, and at lambing time walk five miles around his property checking on his sheep, returning home in time for breakfast. In the early days, he also had a team of horses which were used for cultivating the land, planting and harvesting the wheat. Caring for horses also required rising before dawn to feed and care for them before the day's work began. Then after a hard day's work horses had to be again fed and watered, curried and cleaned. By the time I was born, Pop bad dispensed with his horses and was share farming the wheat out to men with tractors. The stables were converted to a shearing shed. The harness shed for many years continued to house harness and other gear that slowly rotted away, never used but a reminder of those days long gone. Recreation was almost unknown, but as the district grew and local halls and churches were built, some social life began. My father often told of walking for miles at night across paddocks to attend a dance, (though he did not dance), only to "hold the door up" while chatting to his neighbours. When I was born my father would have been 57 years of age and my mother 37. My earliest memories of my father are of sitting happily on his knee by the fireside, while he listened to the news or the market reports. He was a quiet, gentle man and a teetotaller; a man I hardly ever heard swear. While rounding up sheep he could become quite excited, angry and frustrated, but then sheep can be the most frustrating and dumbest of animals. He would occasionally roll himself a cigarette or draw on his pipe. To me, he was a serious, hardworking man whose whole life centred around his farm and his family. He did not have any hobbies or particular interests except the land. Though his life had been a hard one he appeared to have enjoyed his lifelong battle with nature and the elements, for the land was the love of his life. He was a farmer through and through. He enjoyed the company of neighbours, friends and relatives and became more talkative and exuberant, smiled and laughed in their company than in everyday interaction with the family. I did not know the young Charlie Johnson. A cousin once told me he had a great sense of humour. She had known him in his younger days, but during my childhood and teenage years he was ageing and his health was deteriorating. He had many worries of droughts and difficult economic times. Oh to have been born in earlier times when I may have known the tall, strong, youthful Charlie with the thick, black hair which he retained to his dying day. At an early age I realised he was much older than most children's fathers, so one day I asked if I could call him "Pop". "Why do you want to call me Pop?" he asked. My reply was, "because you seem more like a 'Pop' than a 'Dad'" and so it was from then on. He, in turn, always called me "Girlie". My mother's mother, Malvina Mitchell was born in Adelaide in 1856, the daughter of William Mitchell and Charlotte Knight. On 12th August 1873, at the age of 17, she married Edward Taylor at Sandhurst, Bendigo. Edward was born in Adelaide. His father, also Edward Taylor, was a tailor by trade. The Mitchell family came from Cornwall. Malvina's father was a tin miner. As South Australia was settled by free settlers who paid their way - or were sponsored - to emigrate to Australia, the family may have emigrated intending to find work in the tin mines of South Australia as many Cornish miners did. Malvina's death certificate indicates she spent only three weeks in Adelaide and the rest of her life in Bendigo. William and Charlotte moved their family to Bendigo in 1856, probably in search of gold, or to find work.in the already established gold mines. 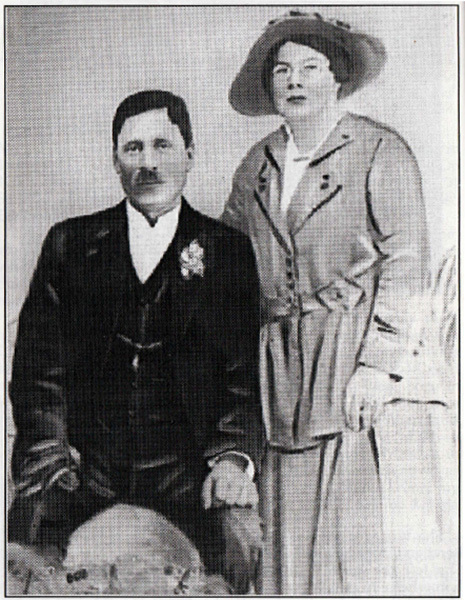 Malvina and Edward's first four children were born in Huntley, Bendigo: Elizabeth in 1875; Mary Ann, who died as a child in 1876; Edward in 1877; and Emily in 1880. Another child Charlotte was born in 1880 but also died. A further seven children were born in Malmsbury: Ethel May in 1884; Alberta Louisa in 1886 (always known as "Bert"); Victoria Isobel in 1888 (known as "Toya"); Harry Leslie in 1892 (known as "Les"); Gladys Irene, my mother, born on 4th April 1893; Stanley in 1895; and Alma Robina in 1897. While my mother was still a small girl, her parents moved from Malmsbury back to Bendigo, where my mother grew up amongst the goldmines of Long Gully. Her father and older brother, Edward (known as 'Ted"), were miners. Her sisters Lizzie, Emily and Ethel married miners. My mother's father, Edward Taylor, died at Long Gully on 23rd June 1913, of heart disease, at the age of 64. Malvina, her mother, died on 11th January 1915, aged 60 at Long Gully of nephritis and apoplexy. My mother was 22. She was working in a laundry in Bendigo when she first met my father. She left the laundry to work as a home-help to my father's youngest sister Ellen, who lived with her husband Jim Watt and their four small children on a nearby farm. It was while my mother was living there that my father courted her. They were married at the Church of England in Swan Hill on 14th November 1917. mother was 24, my father was 44. For their honeymoon, they drove by horse and gig to visit my father's birth-place of Cope Cope, some 50 miles away. His parents were already dead, but he obviously wanted to show her the area of his humble beginnings; the land of his birth and youth. In 27th November 1918, my mother gave birth to a baby boy whom they named Stanley Charles: Stanley after her youngest brother and Charles, of course, after my father. This baby lived only two weeks and was buried in the Ultima Cemetery on 11th December 1918. On 7th December 1919, my mother again gave birth, this time to a baby girl whom they named Vera Ethel; Ethel after my mother's sister. My mother loved and cared for this baby dearly, but when Vera was 10 months old my parents took her to a football match at Lalbert. While they were there her "heavy cold" became obviously more serious. My parents dashed 25 miles by horse and gig to the hospital at Swan Hill. Vera had developed pneumonia. The doctors were not able to save her. She died on 12th October 1920. My mother was advised by her doctor to have another child as soon as possible to help her deal with her grief. Charles G. and Gladys Johnson. Aged 10 months. (An only child). Dear little Vera, just in your bloom. So it was that on 22nd December 1921, my brother Cyril George, the George also after my father, was born. My mother's doctor told her she may not rear this child either. I never found out why. My mother determined she would rear my brother and did so, but not without some molly-coddling. She often related how during a local outbreak of measles she kept him home on the farm, isolated, away from all possible contacts. Yet the measles still caught up with him. She devoted herself to him; he was her pride and joy. This did not stop her being firm with him though. In some ways, she spoiled him, but I remember her telling of two instances when he did not get his own way. The first occurred after a bout of naughtiness when he ran away before she could punish him. My mother was, when I knew her, about 18 stone and just over five feet in height. She could not run after my brother, so she determined he would be punished when he eventually came home. My brother must have been aware of his mother's intentions for he stayed in the paddock all day, no doubt hoping she would forget the misdemeanour. Eventually, probably when he became hungry, he came back. Then my mother spanked him. According to her, he did not run away again. Another time, when she was in Swan Hill shopping with my Aunty "Bert", my brother said he wanted a toy he saw in a shop window. My mother told him he could not have it, so he decided to put on a turn. There and then, in the middle of the street, my mother whopped him. Aunty Bert was most upset and angry with her for making a spectacle of herself in the middle of the street. My mother was unperturbed and declared she would not have to do it again, and according to her she never did. My brother learnt his lesson both times.